A rule is an action that Outlook 2016 or Outlook 2013 for Windows runs automatically on incoming or outgoing messages. You choose what triggers the rule as well as the actions the rule takes. For example, you can create a rule to move all messages from your manager to a folder or to delete all messages with "Buy now!" in the subject. Choose Rules > Manage Rules & Alerts from the ribbon or choose the File tab and then choose Manage Rules & Alerts. 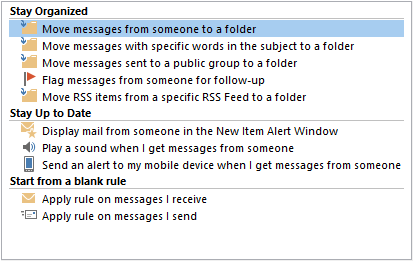 In the Rules and Alerts dialog box, on the E-mail Rules tab, choose New Rule. In the Rules Wizard, under Step 1: Select a template, pick one of the default templates under Stay Organized, Stay Up to Date, or, Start from a blank rule. Each one of the rule templates that you chose in Step 1 has slightly different options for Step 2. When the options require you to make a choice, for example to specify a sender or choose a folder, the option will be underlined. For this example, we've picked one of the most common rules, to move messages from someone to a folder. Choose people or public group in the edit description box to display your address book. Either choose a name from your address book or type the person's address in the From box, then choose OK. Choose specified to display a list of your folders. You can choose an existing folder or choose New to create a new folder. When you've selected the appropriate folder, choose OK. If you want to explore advanced options for the rule, choose Next and then skip to Advanced Rule Options, below. Otherwise, choose Finish. This returns you to the Rules and Alerts window. From here, you can create another rule or choose OK to save your changes. Choose the people or public folder link. In the Search box, type a name. In the Address Book list, choose a source. When your selection is displayed in the From box, choose OK. Choose the specified folder link, and in the Rules and Alerts dialog box, choose a folder, and then choose OK. 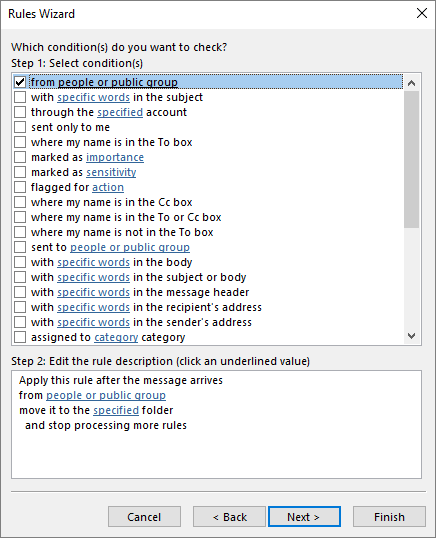 Choose Next and go to Step 3: Set conditions for a rule. Choose the specific words the subject link. In the Search Text dialog box, in the Specify words or phrases to search for in the subject box, type a word or phrase to be searched for. Choose Add to add your entry to the Search list pane, and then choose OK. When your selection is displayed in the To box, choose OK. In the Flag Message dialog box, in the Flag to box, accept the default setting of Follow up, or choose another item in the list. In the For box, accept the default setting of Today or choose another item in the list. Choose OK > Next, and then go to Step 3: Set conditions for a rule. Note: To use this option, you must subscribe to an RSS feed. When you choose this option, there is a prompt to continue. If you choose No, you can't proceed, but if you choose Yes, you can. Choose the specific message in the New Item Alert window link. In the Alert Message dialog box, in the Specify an alert message box, type a message, and then choose OK. Choose Next, and then go to Step 3: Set conditions for a rule. Choose the play a sound link, and in the Select a Sound to Play window, choose a file (for example, a .wav file), and then choose Open. Choose the forward it to people or public group link. You now have the opportunity to add conditions to the options you chose in Step 2: Choose a template option. Based on the conditions you select, the options available to edit the rule description will vary. Under Step 1: Select condition(s), select the check box for the condition you want to add. Note: You can select multiple check boxes. Under Step 2: Edit the rule description (click an underlined value), choose a link, complete the required actions, and when done, choose OK. Choose the next link, complete the required actions, and when done, choose OK. If another link is available, choose it, complete the required actions, and when done, choose OK.